If we have a habit that is less than Christ-like, we must first identify that habit, then work to change it. If you want to break a habit, it feels odd. It turns out there is science behind that. (See link.) However, with Christ’s help we can do anything, including changing unpleasant or unfruitful habits. I have a habit of checking my email and Facebook account too often. Breaking that habit could free me up to do other things. I used to watch a lot of TV. Now I rarely watch it. I managed to break an unfruitful habit. I know I can change other habits. I bet we all have some habits we can change for the better, but it will take time. 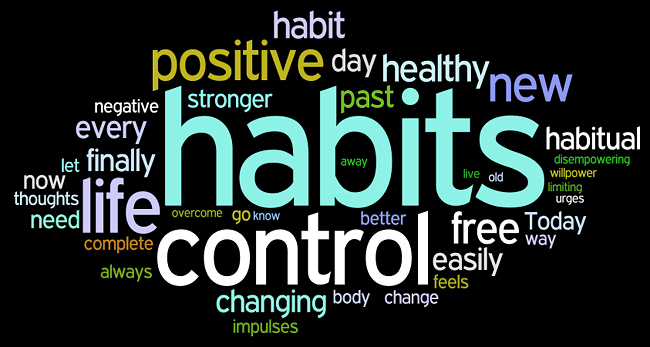 The average time it takes to break a habit is 66 days (see link.) You will have to work at changing the habit; Christ wants to help. Here’s an interesting article on breaking habits. It’s geared toward business and careers, however, the ideas can apply to everyday life as well. Note: if ads are appearing on this page it is because they are placed there by WordPress. In order for WordPress blogs to be ad-free, WordPress charges a fee. If any of these ads inappropriate, please message me. Thank you. This entry was posted in Christ, Christianity, Faith, God's Love, Holy Spirit, Jesus, Refreshment, Spiritual Journey and tagged bad habits, breaking bad habits, habits. Bookmark the permalink. Sis, great thought about habits. Love it. It also become a reminder to always be careful with our habits. Thank you,sis. You always have very good topic to write 🙂 Blessings on your day. Thank you! I’m missing your writing so much. I know you are busy. How can I pray for you? ← And the Answer is…..